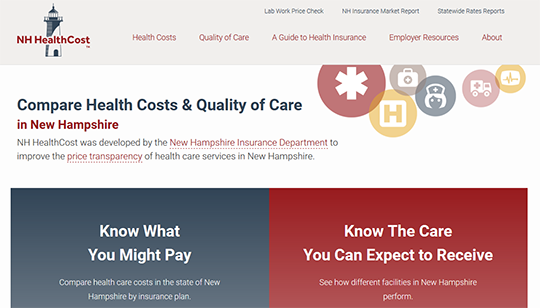 NH HealthCost provides a convenient way to see nationally available quality data on local health care facilities, including quality and patient experience data. The site allows side-by-side comparisons showing cost and quality results by provider for dozens of common medical procedures such as MRIs, CT scans and surgeries. Results include costs for physicians and other staff, hospital or outpatient facility fees and additional costs associated with the test or treatment. NHHealthCost.org uses paid claims data collected from New Hampshire’s health insurers to show insured and uninsured patients’ estimated costs on more than 100 medical services and dozens of dental procedures. Hospital quality data is provided by the Centers for Medicare and Medicaid Services. Health plan comparisons are based on insurance department data and well – respected national organizations including the National Committee on Quality Assurance.